I made this a very long time ago, maybe a year and a half. Sometimes I browse my photos and wonder if maybe a card has been missed. Now I have a ‘Not Posted’ File so that helps but when I’m in a hurry, it’s so hard to keep track! Originally I designed this layout as a ‘thank you for your business’ card, without the pearls and with black and gold or black and ivory paper on bottom, for a friend’s business. My BFF saw it and much to my delight, went on and on about how it was hte prettiest card she’d ever seen and how she’d frame it. So of course, I obliged making her one. 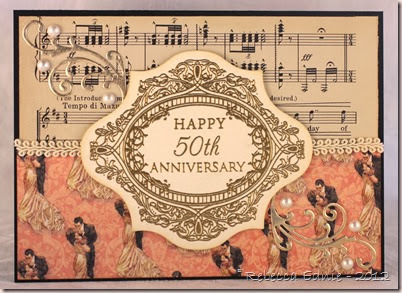 Then I had the opportunity to make it again for a very classy couple for their anniversary . I thought adding the dancing couple was a nice touch. please email for details. Most manufacturers are found in the tags.